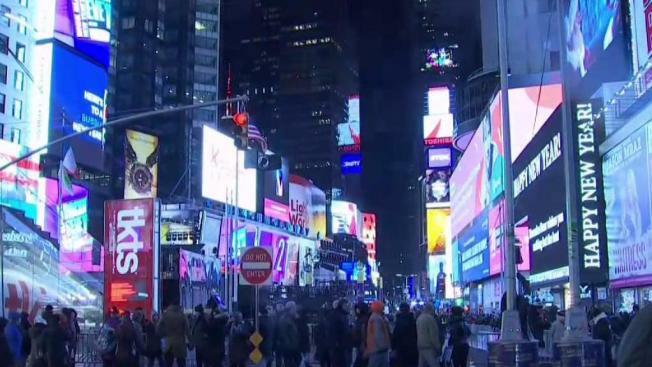 An NYPD officer was hit by an accelerating car as the driver fled during a traffic stop in the middle of Times Square late Saturday night, police said. The car, which appeared to be modified for drag racing, was driving recklessly on West 42nd Street when the officer tried to pull it over near the famous NYPD booth shortly before midnight, the NYPD said. Dramatic video posted online appears to show the officer standing in front of the car near West 43rd Street and Broadway in an attempt to stop it when the vehicle suddenly skids off. The driver then accelerates and the officer is knocked to the ground as the vehicle drives away. He and several other officers chase the car through the streets with their guns drawn, but the car manages to escape through heavy traffic down 42nd Street. The officer who was hit can be seen dropping to his knees on West 42nd Street as the vehicle gets away. "That's big time crazy. People are getting crazy, you know," said Freddie Kim, who operates an outdoor souvenir stand nearby. Kim said he saw the smoke emanating from the vehicle as it burned rubber while getting away. Drivers will often burn rubber or drive recklessly around Times Square to get attention, Kim said. "It happens often here. Those guys try to show off," he said. Police said Sunday they are aware of the video and will examine all evidence to track down the driver. The NYPD is looking for a black, four-door Mercedes sedan. The officer was taken to Mount Sinai Hospital with minor leg injuries.